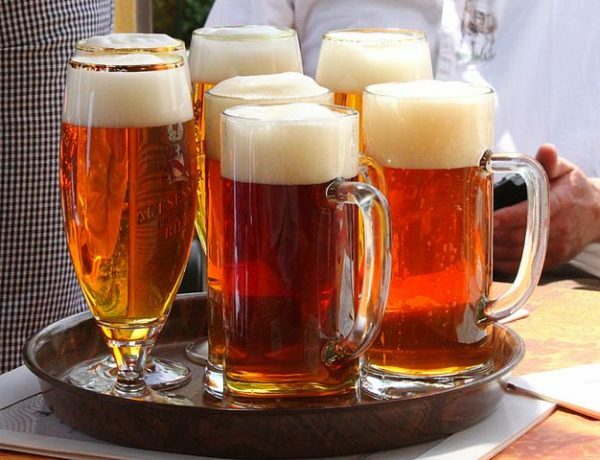 German brewers will no longer be able to advertise their beers as “bekömmlich” (wholesome) following a ruling by the Federal High Court (BGH), The Local reports. According to the BGH, the word “bekömmlich” has connotations of health benefits and thus cannot be used as it falls foul of European Union regulations on advertising alcohol, which must avoid any suggestion that alcohol is good for a body. In 2015 a case was brought against Brauerei Clemens Härle KG of Leutkirch im Allgäu in Baden-Württemberg against the brewery’s use of “bekömmlich” in advertising. After a series of appeals through lower courts, the BGH finally ruled on Thursday ruled that breweries were not allowed to describe their beers in terms that portray them as having health benefits. That ruling and the EU legislation puts paid to any return of Arthur Guinness’ “Guinness is good for you” advertising slogan for the Dublin’s most famous liquid export. The situation of Sanatogen Tonic Wine (marketed in the UK as a fortified wine with an alcohol content 15%), remains unclear. For as long as I can remember in my adult life, I’ve listened to budget speeches with a mixture of incredulity and a sinking heart. This is usually because Chancellors of the Exchequer have more often than not made drinking beer – one of life’s pleasures – more expensive. Fortunately that didn’t happen this time round. However, Wednesday’s offering from Gideon Oliver Osborne (aka George or Gidiot. Ed. ), prompted me to write to my MP, Thangam Debbonaire, on the devolution deal for the West of England (PDF). I trust you’ve fully recovered from your illness. I write on the above subject to express my concerns in the wake of yesterday’s budget. Whilst I would welcome increased public money for the area, I do feel that the manner in which this will be accomplished needs lots to be desired. I have downloaded and read the final draft of the deal agreed between central government and the 4 local authorities and this has increased my concern. I feel very much that this devolution deal is being done to us rather than for us residents. This feeling is reinforced by the fact that there has been little or no public consultation to the best of my knowledge, nor will the public have any say on the final outcome. It’s a prime example of top-down imposition. When this matter was tabled by Easton ward councillor Anna McMullen at the last Ashley, Easton & Lawrence Hill Neighbourhood Partnership, there was condemnation of the lack of consultation and the short amount of time remaining before this devolution deal was imposed. “I will be making it very clear to all my councillors that I’m very opposed and I hope they will reject this. “It is the recreation of the Avon and the agreement would be for a metro mayor that voter have never given their assent for. It is not very often I find myself coming out with similar sentiments to that particular gentleman. I really feel that we, those who will be affected by this devolution measure should be firstly consulted on it and secondly have the chance to vote on both the deal itself and the creation of the office of metro mayor. However, I am not very encouraged that we shall have the chance to do so as I was notified via Twitter yesterday by a contact in Manchester that their metro mayor was imposed with no public input whatsoever. Reading today’s Bristol Post, I note that Pat Rooney in S. Gloucs. wants to see a referendum held on any metro mayor. I fully support this move. Given the concerns of many active citizens both in the city and surrounding areas is there anything that can be done to ensure proper public input to the devolution process, which I feel is destructive of local democracy, piecemeal and ultimately bound to end in a real dog’s dinner. In the two days since the Budget, a petition has also been organised to reject the devolution deal that was concocted in secret by a bunch of middle-aged white men (who always think they know what’s best of us. Ed.). The Chancellor of The Exchequer announced on March 16th a scheme to devolve powers to a Metro Mayor in Bristol, Bath and surrounding areas. Given that B&NES rejected an elected Mayoral model one week earlier, this new announcement seems to be at variance with the electorate’s preferences. 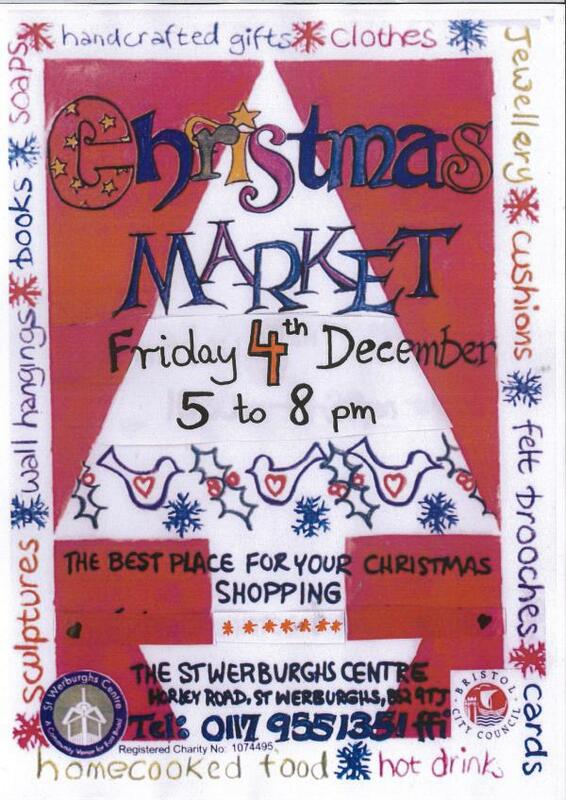 A Christmas Market is taking place at St Werburghs Community Centre this coming Friday, 4th December from 5.00 to 8.00 pm. The Christmas Market is yet another very popular community-led event hosted by St Werburghs Community Centre. Join us on Friday for a festive feast of all things creative and buy original arts and crafts from the best local artists and makers. There are always plenty of wonderful stalls booked filled with personal, handmade and unique gifts for your family and friends. If you need any more convincing to come along, here’s a short video from last year’s event. For more information, please contact the Centre on 0117 955 1351 or e-mail on office [at] stwerburghs.org.uk. It’s your ‘umble scribe’s 60th birthday this week and to mark this occasion, Hilary and Andrew, my siblings conspired to take me away from Bristol for the weekend. When we were sorting out our late mother’s estate, we all expressed a wish for a sibling saunter in Staffordshire and this proved the ideal excuse. Andrew and Hilary made the arrangements, whilst I researched walks and gave them 2 options – one involving a circular walk round the Head of Trent (the upper reaches of the Trent before it enters the city of Stoke on Trent. Ed. ), the other a walk round the site of the Battle of Blore Heath, one of the first major battles of the Wars of the Roses, which was fought on 23rd September 1459. In the end the Blore Heath won and found the assembled siblings outside the Loggerheads Hotel in Loggerheads ready to start walking the excellent route provided by the Blore Heath website. The route comprises a circuit of the main battlefield down its eastern flank along what would have been the Lancastrian line, then down through the valley which saw the most fighting. There is then a walk through woodland and up towards the quiet village of Mucklestone, where it is said that Queen Margaret watched the battle unfold. The battle occurred when the Yorkist force based at Middleham Castle in Yorkshire (led by the Earl of Salisbury) needed to link up with the main Yorkist army at Ludlow Castle in Shropshire. As Salisbury marched south-west through the north Midlands, Queen Margaret ordered Lord Audley to intercept them. Audley chose the barren heathland of Blore Heath to set up an ambush. 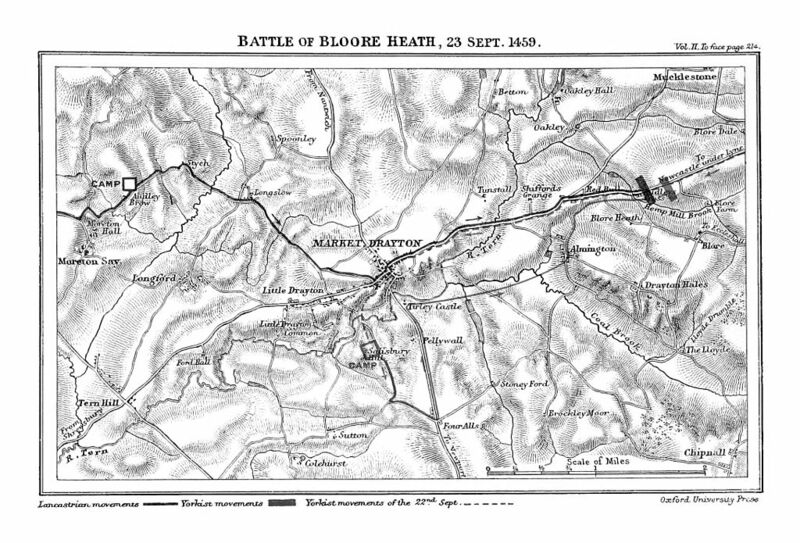 On the morning of 23rd September 1459 (Saint Thecla’s day), a force of some 10,000 men took up a defensive position behind a ‘great hedge’ on the south-western edge of Blore Heath facing the direction of Newcastle-under-Lyme to the north-east, the direction from which Salisbury was approaching. Yorkist scouts spotted Lancastrian banners over the top of the ‘great hedge’ and immediately warned Salisbury. As they emerged from the woodland, the Yorkist force of some 5,000 men realised that a much larger enemy force was awaiting their arrival. Salisbury, instead of disbanding or withdrawing his army, immediately arranged his troops into battle order, just out of range of the Lancastrian archers. To secure his right flank, he arranged the supply wagons in a defensive laager, a circular formation to provide cover to the men. Fearing a rout, Yorkist soldiers are reported to have kissed the ground beneath them, supposing that this would be the ground on which they would meet their deaths. The two armies were separated by about 300 metres of barren heathland. A steep-sided, wide and fast-flowing brook – the Wemberton or Hemp Mill Brook – ran between them. The brook made Audley’s position seemingly impenetrable. Initially, both leaders sought unsuccessfully to parley in an attempt to avoid bloodshed. In keeping with many late medieval battles, the conflict opened with an archery duel between the longbows of both armies. At Blore Heath this proved inconclusive due to the distance between the two sides. Salisbury, aware that any attack across the brook would be suicidal, employed a ruse to encourage the enemy to attack him. He withdrew some of his middle order just far enough that the Lancastrians believed them to be retreating. The Lancastrians launched a cavalry charge. After they had committed themselves, Salisbury ordered his men to turn back and catch the Lancastrians as they attempted to cross the brook. It is possible that the order for this Lancastrian charge was not given by Audley but it had the effect of turning the balance in favour of Salisbury. The charge resulted in heavy casualties for the Lancastrians. 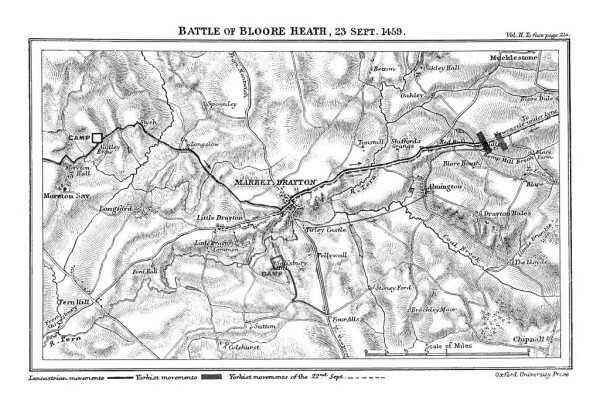 The rout continued through the night, with the Yorkists pursuing the fleeing enemy for miles across the countryside. Salisbury employed a local friar to remain on Blore Heath throughout the night and to discharge a cannon periodically in order to deceive any Lancastrians nearby into believing that the fight was continuing. 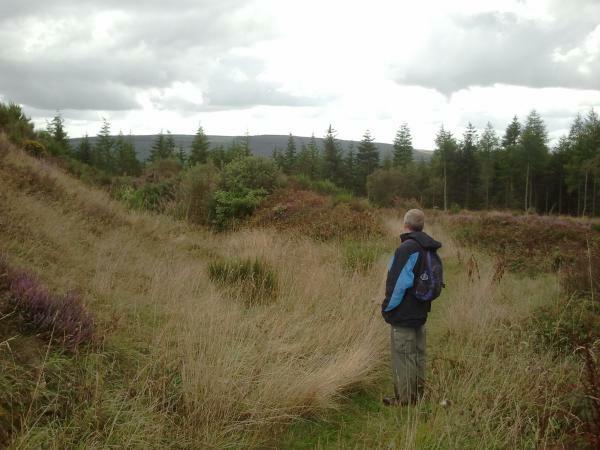 Starting from Loggerheads, we skirted the borders of Burnt Wood (called “Rounhay wood” at the time of the battle. Ed.). We were following the route that the Yorkist forces would have taken. 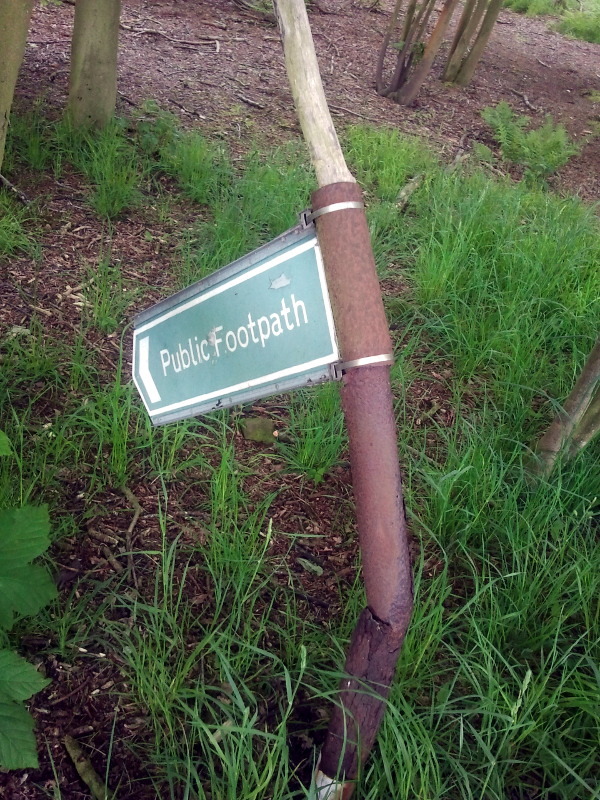 This top end of the walk was quite boggy, so good waterproof boots are recommended. From this high point of the walk there are fantastic views across Shropshire to the mountains of North Wales, some forty miles away. 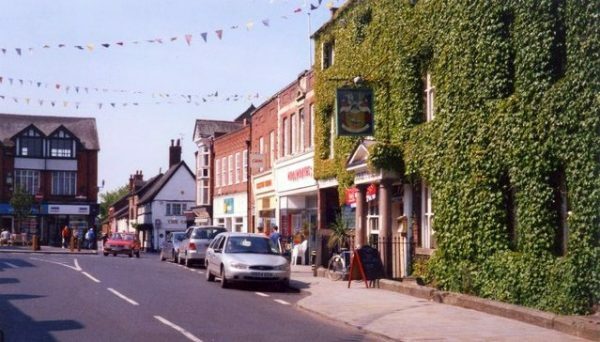 The landmark of the Wrekin is clearly visible to the SW and is about 20 miles away, as is the tower of St Mary’s Church in Market Drayton, some 4 miles away. We continued downhill to the hamlet of Blore, where we turned onto a a lane and then from the edge of the hamlet followed the line of the ‘great hedge’ behind which the Lancastrian banners were seen. The hedge has been much reduced in stature by the invention of the flail mower, but experts believe it has been in situ for 1,000 years. Halfway along the hedge is a large horse chestnut tree from which Audley’s Cross – marking the spot where Lord Audley was slain – can be seen. 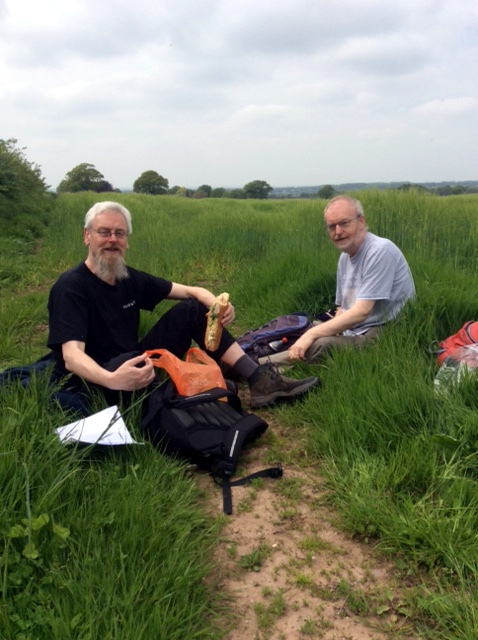 We stopped for lunch near the end of the ‘great hedge’ roughly at the end of the Yorkists’ left flank. The brothers dine near the end of the Lancastrian left flank. Picture courtesy of Hilary Midgley. From the lunch stop we proceeded downhill across the fields downhill and around the southern edge of the battlefield towards Hemp Mill Brook and a crossing of both it and the A53, the latter being particularly dangerous due to its narrowness, bends and the speed of the traffic. At this point we deviated from the route and went up the A53 for a better view of Audley’s Cross (a cross has stood on that spot since the day of the battle. Ed.) before returning to the actual route of the walk. Once over the A53 and back on the route, we followed a lane for a short while, then proceeded through Folly Wood to the outskirts of Mucklestone, entered the village and headed for the church. It was from the top of the Mucklestone church tower that Queen Margaret is said to have stood and watched her forces defeated. She is then supposed to have made good her escape in the direction of Eccleshall by forcing William Skelhorn, the village blacksmith, to reverse her horse’s shoes, thus confusing any pursuit. 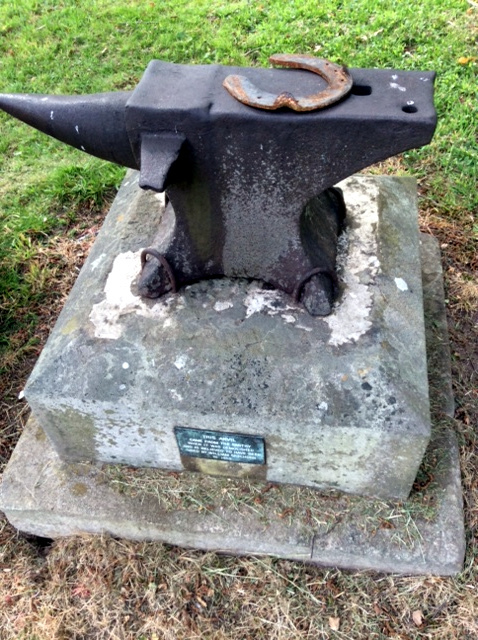 The anvil in the churchyard, which was retrieved from the smithy when the latter was demolished, commemorates this legend. The anvil is sited next to the grave of another, much later member of the Skelhorn family. Anvil in Mucklestone churchyard. Picture courtesy of Hilary Midgley. From Mucklestone we proceeded up a rough track called Rock Lane to return to our starting point in Loggerheads. After the battle the victorious Lord Salisbury, anxious to press on towards Ludlow and the main Yorkist forces, moved south, camping on a hill on the outskirts of Market Drayton ever since known as Salisbury Hill. When we were children, this was the main hill in the town for sledging when it snowed. This delight is now out of bounds to today’s Drayton children, as the hill has been absorbed into the land occupied by the local golf club and the stile we used for access is no longer in situ. After a most satisfactory walk we all retired to Newcastle-under-Lyme for a night in a hotel, preceded by an excellent curry and a couple of beers in Audley. The British pub – undergoing gastration? I’m a great lover of no-frills, working-class pubs. They’re what I grew up with and frequented when I first started drinking. Indeed I still give them my custom and can often be found at the Little Russell in Barton Hill, Bristol (posts passim). One worrying development in recent years is the rise of the ‘gastropub‘. 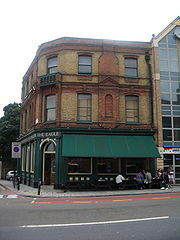 The Eagle, Clerkenwell, London, reputed to be the first victim of gastration. Picture courtesy of Wikimedia Commons. The term gastropub is a portmanteau of gastronomy and pub, and originated in the United Kingdom in the late 20th century. The establishment itself is defined as ‘a bar and restaurant that serves high-end beer and food‘. gastrate (v.) – to ruin a perfectly good pub by converting it to sell small, overpriced portions of food. The process of gastration is also being actively encouraged by the media, as shown in a piece last week on the Bristol Post website. Will traditional drinkers soon be struggling to find traditional boozers if this trend continues? Siblings at Bury Ditches picnic area. Picture by Hilary Midgley. Each year one of my great delights is to go walking in Shropshire with my sister Hilary for a couple of days (posts passim). This year’s annual sibling saunter did indeed take place last week, but with one important change: our brother Andrew was able to join us for the first time on Thursday evening (after Hilary and I had done our inaugural afternoon walk) and take part in Friday’s walk. 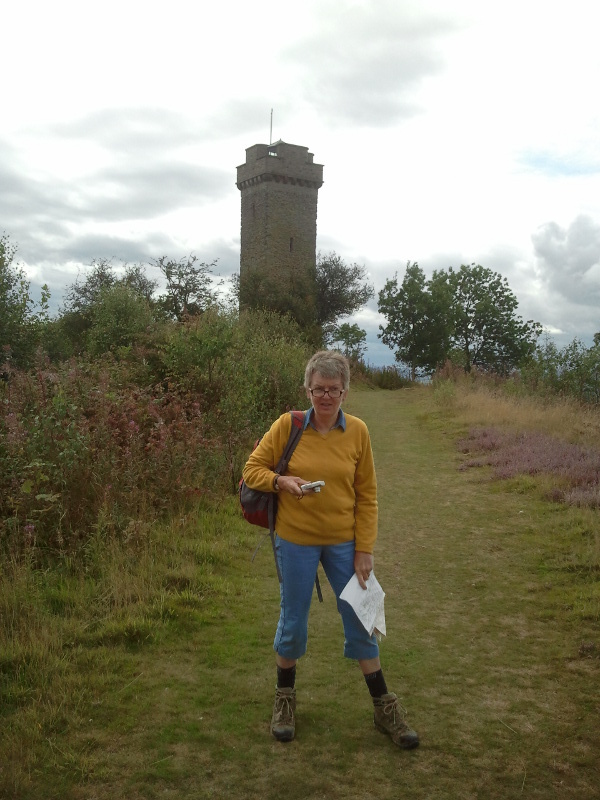 After meeting up in the late morning in Craven Arms and some light refreshment, Hilary and myself set out on a 6 miles circular walk to Flounders’ Folly on Callow Hill and back, following an excellent route provided by the AA. The folly was built in 1838 by Benjamin Flounders – a prominent English Quaker and local businessman originally from Yorkshire – and fell into disrepair in the 20th century, but was restored in 2004-5 by the Flounders’ Folly Trust with aid from the National Lottery. It’s now open to the public one day per month so people can climb to the viewing platform at the top of the 78 stairs and enjoy wonderful views of the Malverns, the Black Mountains, Cader Idris and much more. The route up to the folly consisted of a steep climb through active forestry workings, but the view from the top was well worthwhile. As with last year, we stayed at Clun Youth Hostel, a converted water mill with most of the mill machinery still intact. The remains of the millpond can still be seen just up the road by the Memorial Hall and there are rumours that it is to be restored. The volunteer wardens at the hostel were most helpful and hospitable, whilst fellow hostellers didn’t snore too much! 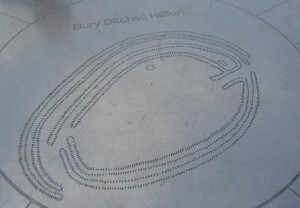 The following morning after breakfast we set out from the hostel to visit the motte and bailey at Lower Down and the Iron Age hill fort at Bury Ditches on a circular route measuring somewhat over 8 miles. The route out to Lower Down meandered through farmland, including a couple of sunken lanes reputed to have been used by monks, and woodland. Towards Lower Down, some splendid views were had of the Stiperstones and Corndon Hill, high point of one of last year’s walks. Lower Down’s motte and bailey can be viewed by going through the kissing gate next to the telephone box and pillar box. The field in which they are sited is also reputed to contain medieval settlement remains. After Lower Down there followed a long climb (during which the rain commenced. Ed.) up to the Bury Ditches picnic area where lunch was taken, followed by the long, gradual ascent up to the hill fort itself. The entry into the hill fort is from the north east through 3 sets of concentric earth bank defences. When the fort was originally constructed about 2,500 years ago, these earth banks would have been surmounted by wooden palisades. In the steady drizzle, we wandered up to the toposphere in the centre of the fort to admire the views and get our bearings as we had to leave hill fort via its south west entrance/exit. As we approached the exit, the rain eased off and out came the cameras to record our visit. Descending from Bury Ditches, we then dropped down through woodland a giant sequoia to skirt Steppleknoll to return across the fields (where red kites were seen) to Clun and a welcome couple of pints in The Sun Inn. 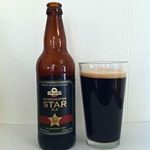 We can recommend the restorative properties of the Three Tuns Brewery’s beer, as we all sampled the Porter and found it excellent, whilst your correspondent also savoured the very hoppy IPA. Both days’ walks included a ford too, although neither was particularly deep, as shown by the one through the Quinny Brook on the Callow Hill walk. 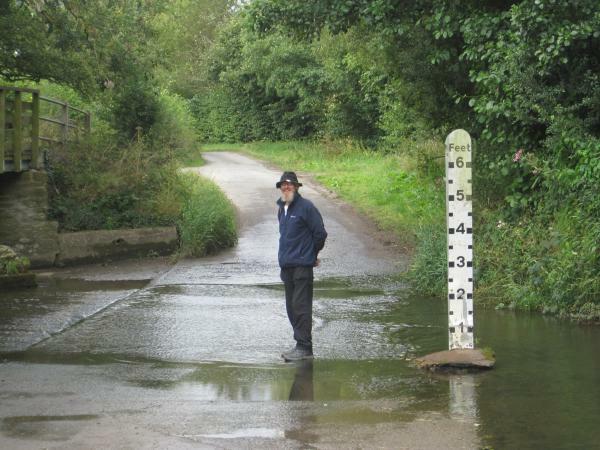 The author testing the depth of the ford. Picture courtesy of Hilary Midgley. Planning has already started for next year for a visit to another hill fort near Craven Arms and returning via Stokesay Castle, as well as an exploration of Offa’s Dyke south of Newcastle on Clun. In Bristol’s Barton Hill district, there’s a lovely little pub affectionately known as the Little Russell (its real name is the Russell Arms; the ‘Big’ Russell used to be nearby on Church Road, Lawrence Hill, but has long since closed. Ed.). It’s a friendly place and is little changed from when it first opened in the 19th century. 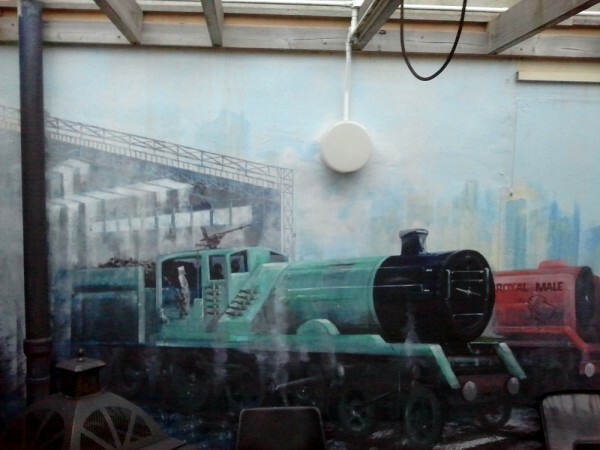 One change in recent years, however, is the addition of a fine mural by local artist Andie that covers 2 walls of the yard, which has since the smoking ban become the pub’s smoking area. Part of the mural is shown below. The train in the shot is known as Rainbow Worrier because it’s green and has a shady-looking character in a hoodie in the cab. Note the machine gun and the fish-shaped bombs; they’re more reason to worry. Andie is definitely a man with a sense of humour and I love his punning references; note ‘Royal Male’ on the next locomotive. Rainbow Worrier itself reminds me of reading about the armoured trains that used to chug up and down the Russian railway network around the time of the Russian revolution. For instance, the Czechoslovak Legion used heavily armed and armoured trains to control large lengths of the Trans-Siberian Railway (and of Russia itself) during the Russian Civil War. 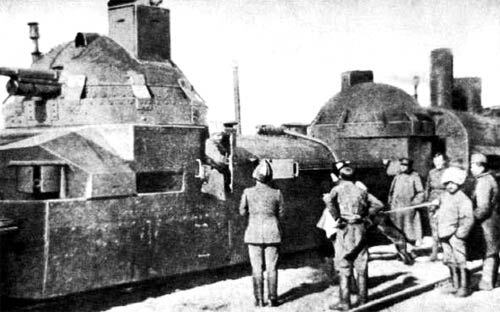 One of the Czechoslovak Legion’s armoured trains is shown below. I wonder if these trains or the later ones used in World War 2 were what inspired Andie; or was he just having fun?